The Fern Creek and Western Railroad owns 11 locomotives. These engines are all built to replicate steam engines common to the time period. Most of the engines are of the 1:20.3 narrow gauge scale, however there is one odd ball that is 1:24 scale. Locomotives of the FC&W use all three forms of power that are offered in G scale. 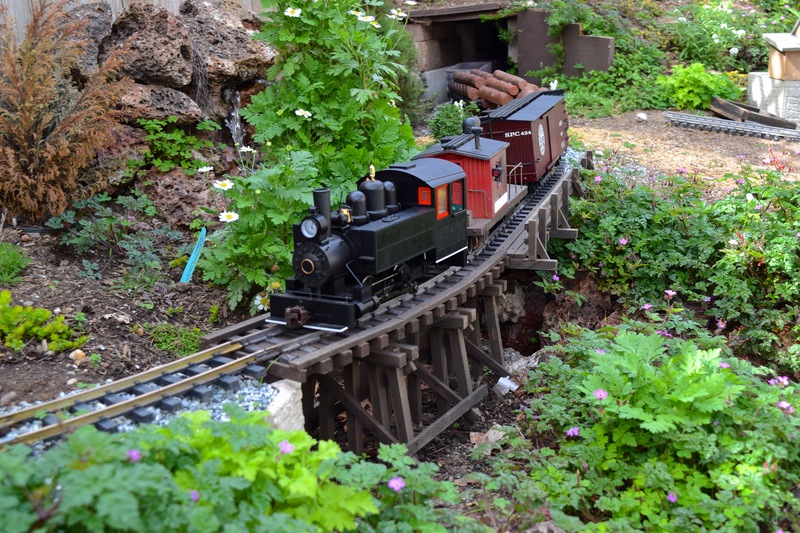 We have 7 track powered engines, 4 battery powered engines and 1 live steam engine. Our fleet is one of the more interesting parts of the railroad, given that you may not know what will be running on the railroad on a given day. Originally numbered #3, Shay #1 is a Bachmann Spectrum 36 ton “Shay” Locomotive that was purchased by our friend Chris Gupta as a fixer-upper engine. It was beat down to a point where it could no longer operate and major work needed to be done. Chris revived the engine from its broken state, replacing all the worn out parts and essentially rebuilding the locomotive. After its extensive rebuild it was donated to the FCW and became the first locomotive ever used by the railroad, making it a very special part of the fleet. We have two other #3 engines, so in 2017, it was decided to renumber the engine to #1. This was done so that the numbering of the engines would be less confusing and to reflect the engines history with the railroad as our first engine. Today it serves as a logging locomotive on the railroad as well as an engine for industrial work. SPC #3 crossing the Upper Fern Creek Bridge with a passenger train. A Daniel Cortopassi photo. South Pacific Coast #3 is a Bachmann Spectrum model of a 4-4-0 American type locomotive. These engines were common passenger haulers and were one of the first locomotives extensively used in North America. Originally owned by Chris Gupta, this engine came to the FCW with weathering on it. 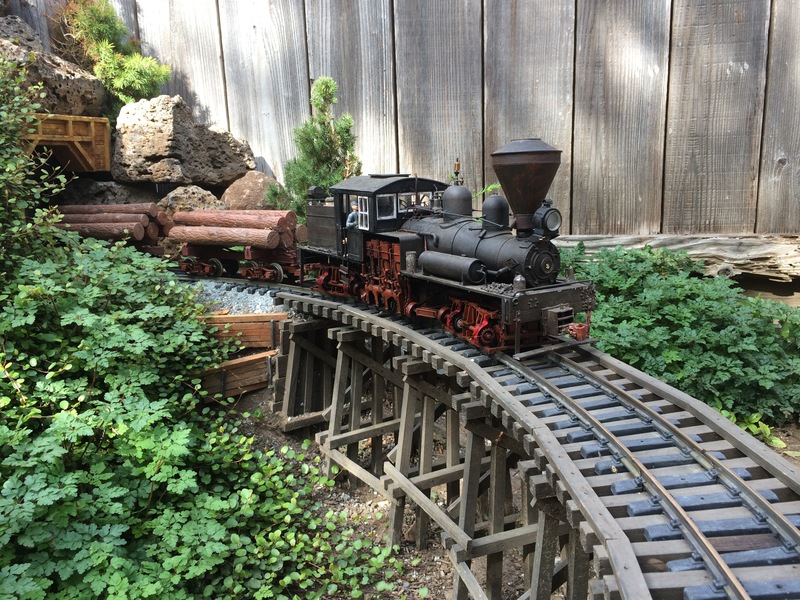 The railroad lives by the notion that its equipment should be clean, and in the summer of 2015, Trevor Park stripped the locomotive down to the original paint using only cotton swabs and alcohol. Though most of the engine is in its original paint the boiler was repainted to a color very close to what it came out of the factory with. After this extensive cleanup, the engine got another major upgrade. In September of 2015 the engine was converted from track to battery power. Now the engine is one of the most common engines to see running on the railroad, especially with its matching SPC passenger cars. Climax #3 crosses the Priya Canyon Trestle. A Trevor Park photo. 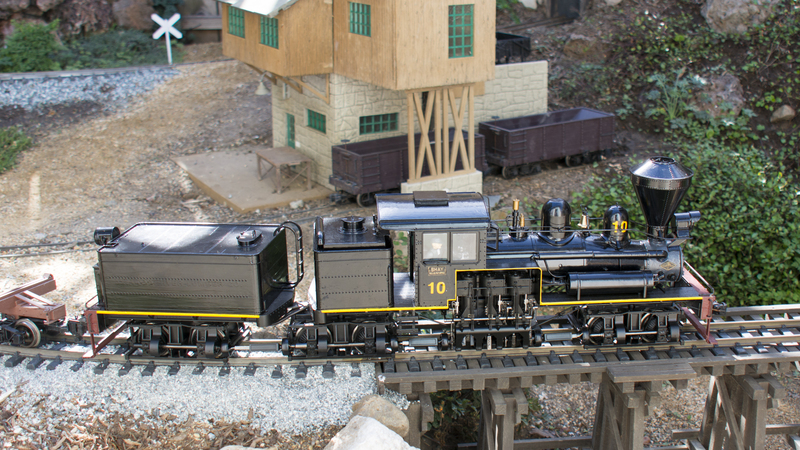 Elk River Coal and Lumber Company #3 is a Bachmann Spectrum model of a 2-Truck Climax locomotive. This engine is one of the newest in our fleet. The locomotive runs frequently on the FCW, primarily in switching service around at the Parkston Yard. This locomotive was converted to radio control and battery operation in early 2017, making it our first two-truck geared engine to receive such a conversion. Porter #4 crosses the Upper Fern Creek Bridge with a local. A Trevor Park photo. Fern Creek and Western Porter #4 is a Bachmann Spectrum model of an 0-4-0 Porter locomotive. The engine is the designated switcher at Parkston, but she also sees service out on the line with short locals or with maintenance of way (MOW) equipment. #4 was the first engine that the railroad converted to battery, and it was quite a learning experience. The engine took over 4 months to convert, with much trial and error in the process. When she was finally done, however, she soon found her place as a great switcher for Parkston, not only for the yard but also for the local industries. Always with her trailing shunting platform which contains the batteries she uses, #4 is a common engine to see on the FCW, especially when operating sessions occur. Climax #6 powers upgrade with the log skidder and empty log cars as it passes over the Priya Canyon Trestle. A Trevor Park photo. Fern Creek and Western Climax #6 is a Bachmann Spectrum model of a 25-ton 2 truck “Climax” locomotive. She was donated to the FCW by Chris Gupta in October of 2014. She was also a fixer upper, much like Shay #3. She came to Chris from a member of a local model railroad group with broken parts and lots of damage, though she was operational unlike the #3. #6 was given a complete makeover and was finished only the night before she was going to be donated. Climax #6 is of an older generation of Climaxes manufactured by Bachmann when compared to Elk River #3. She has had many upgrades, including die-cast trucks and a new smoke unit. #6 is commonly seen in logging and local freight service along Shay #3. #8 climbs the grade as it nears Priya Canyon. A Trevor Park photo. Fern Creek and Western #8 is a 2-4-4 “Forney” locomotive. She holds the designation of being the only Live Steam engine on the railroad. #8 was built by Accucraft Trains and is fired on butane. Using the butane, the engine heats distilled water which produces steam to power the cylinders and the steam oil lubricator on the locomotive. Though she is small, #8 can handle up to 4 cars on the grade in either direction. 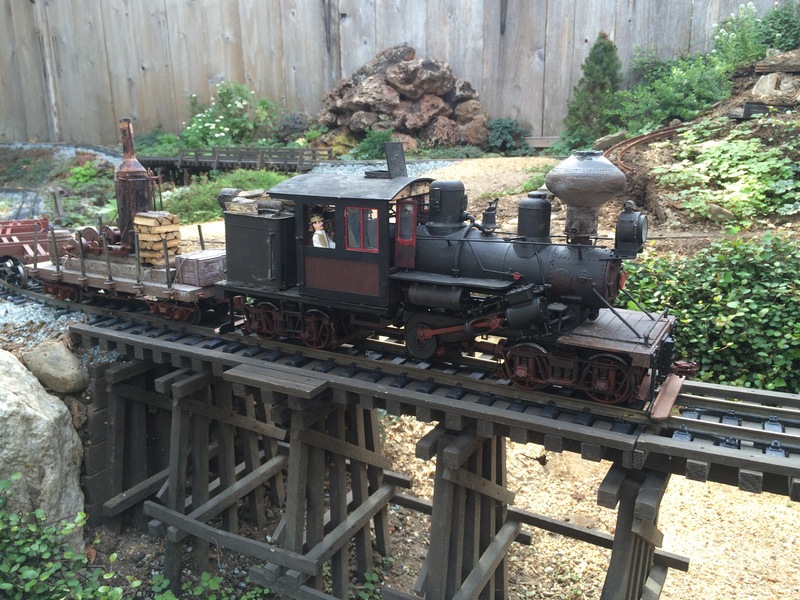 She is also radio-controlled so she can be operated easily and safely on our railroad. The steep grades and tight turns aren’t always friendly to live steamers. But the little Forney does a great job with these elements, it just requires working the engine a little harder. We frequently run #8 during Open Houses due to the fact that she is a crowd favorite, but she runs less frequently during work days and regular run days as she requires being steamed up and also can be challenging to operate. Though she has many strange traits, her interesting operation and life like appeal makes her a favorite of the railroaders and the public. Shay No. 10 pulls a log train onto the Priya Canyon Trestle. A Daniel Cortopassi photo. Fern Creek and Western #10 is a Bachmann Spectrum model of a 3-truck “Shay” locomotive. #10 is arguably the largest and definitely the most powerful engine on the railroad. 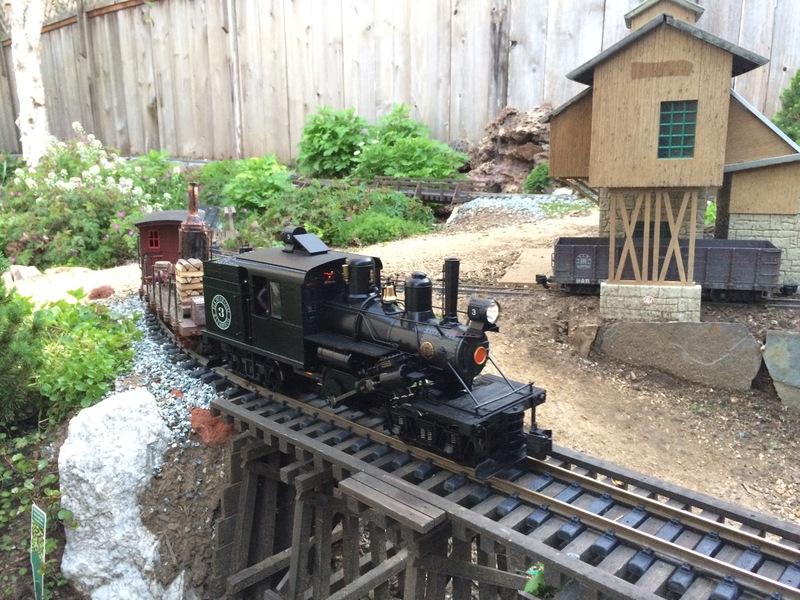 #10 is also one of our battery powered locomotives, making her a common engine for us to run. 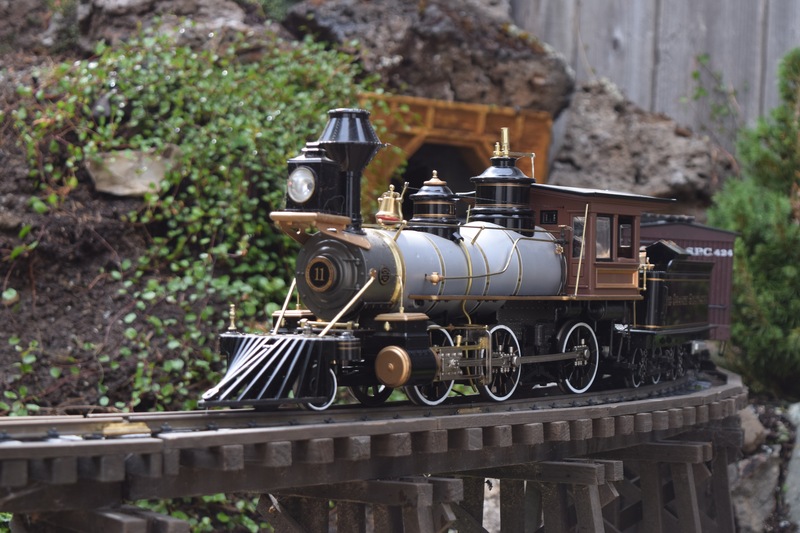 The engine was modified by Chris Gupta specifically for the Fern Creek and Western to look like engine #10 of the Yosemite Mountain Sugar Pine Railroad, located in Fish Camp, California. Our #10 serves the FCW in heavy and long distance logging operations out of Parkston from the front yard to the back yard. RGS #11 coasts downgrade over the Priya Canyon Trestle. Rio Grande Southern #11 is a Bachmann Spectrum built 2-6-0 Mogul locomotive. #11 is one of the best running engines on the railroad and has a rich history with the Fern Creek and Western. 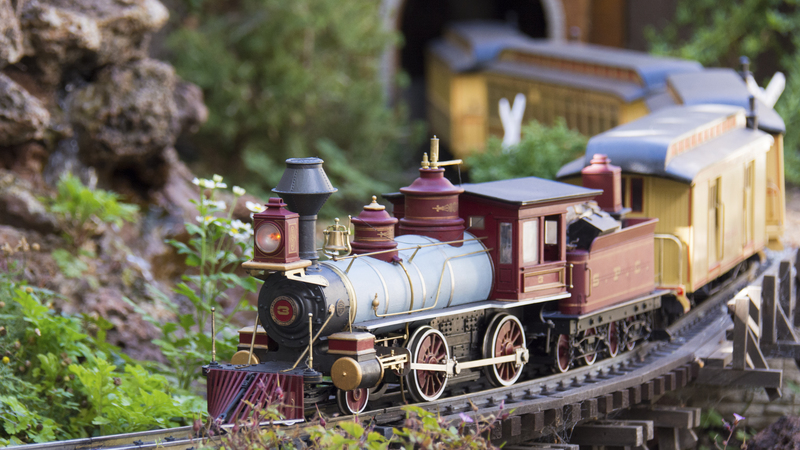 One of her claims to fame is that she was the first locomotive to ever run all the way around the railroad’s loop. 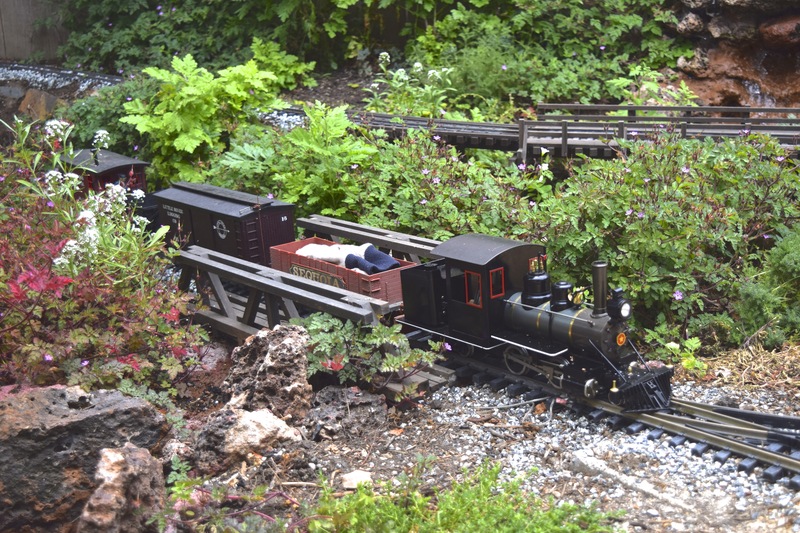 The #11 was converted to radio control and battery operation just in time for the National Garden Railway Convention open house on July 6, 2016. The engine is primarily used in commuter passenger service today. C-19 Consolidation #12 powers a freight over the upper Fern Creek Bridge. A Trevor Park photo. Fern Creek and Western Railroad #12 is a 2-8-0 Consolidation type locomotive that is modeled off of a Denver and Rio Grande C-19 Class locomotive. This locomotive is the newest in our fleet and is by far the most mechanically and electronically advanced locomotive we have. The engine not only has a computer board in the tender for plug and play operation, but it also has an all metal gear box, giving her a great deal of pulling power. She is also very heavily detailed and has almost every part separately applied. The engine was converted to radio control and battery operation in June of 2016. All these things make her a mainstay on the FC&W. C0nsolidtion #13 crosses the Upper Fern Creek Bridge with a freight. A Trevor Park photo. Fern Creek and Western Railroad #13 is a Bachmann Spectrum 2-8-0 Consolidation locomotive and is the largest of the rod locomotives on the railroad. She does all of the heavy freight hauling on the FC&W and is one of the more used locomotives on the line. The 13 was donated to us by Chris Gupta. #13 is also the most temperamental engine mechanically of the fleet. Her large size and cumbersome nature makes her fall victim to occasional mechanical failures, however, these factors are weighed out by her great pulling power and great sound. In December of 2015 the locomotive was puller out of service for an extensive rebuild. The locomotive’s old weathering was completely taken off and the engine was given a new paint job. After this the locomotive was mechanically rebuilt and then it was given Airwire Radio Control and battery operation so it no longer relied on track power. After a 3 month stint in the shop the locomotive came back into service on March 31, 2016. This locomotive is now a very common sight on the railroad. South Pacific Coast #21 leads a train into the front yard in preparation for our very popular October Open House. SPC #21 is a Bachmann 4-6-0 Annie that is one of the primary engines on the FCW. The #21 hauls both freight and passenger trains on the FCW and has also been on the FCW property longer than any other engine. This locomotive ran on Eric’s old garden railroad and was in storage when the Fern Creek and Western was started. Eric then discovered it in the attic and upon cleaning the wheels and the rest of the engine, we discovered it still ran but not very well under track power. We decided to convert the engine to radio control and battery operation with Tsunami Sound making it our first battery engine for heavy mainline service. This engine is a common site on the Fern Creek and Western and has proved her worth on the narrow gauge. Fern Creek and Western #52 pulls a commute train over the Upper Fern Creek Bridge. A Trevor Park photo. Fern Creek and Western #52, named “Manaka” by her builder Chris Gupta is an Aristocraft C-16 class 2-8-0 Consolidation. She is much smaller than Consolidation #13 because she is 1:24 scale instead of 1:20.3. Her small size makes her look like an industrial 2-8-0 however and this renders her well equipped for light commute service which is her primary job. #52 runs only during open houses when the track is clean due to her poor performance under track power. However, she is most definitely in line for a battery conversion. Porter #2 and FCW #4 head upgrade with a track gang train at Parkston. A Trevor Park photo. Porter #2 is a Bachmann Saddle Tank 0-4-0. The engine is on loan from Chris Gupta. She primarily handles switching duties in Ericsville but can also be seen working around the railroad doing transfer moves and pulling work trains. #278 pulls an empty gondola and a caboose through the switch at Camp 2. A storm has washed a lot of the fill out next to the tracks. A Trevor Park photo. Rio Grande #278 is an Aristocraft C-16 2-8-0 Consolidation on loan from Chris Gupta. Though her appearance may look different, she is an identical locomotive (in terms of specifications) to FC&W #52. The #278 handles light mining operations and small work trains on the railroad. Like #52 however, she is plagued with weak track power capabilities which make her only appear during open houses and other events where the track is very clean.